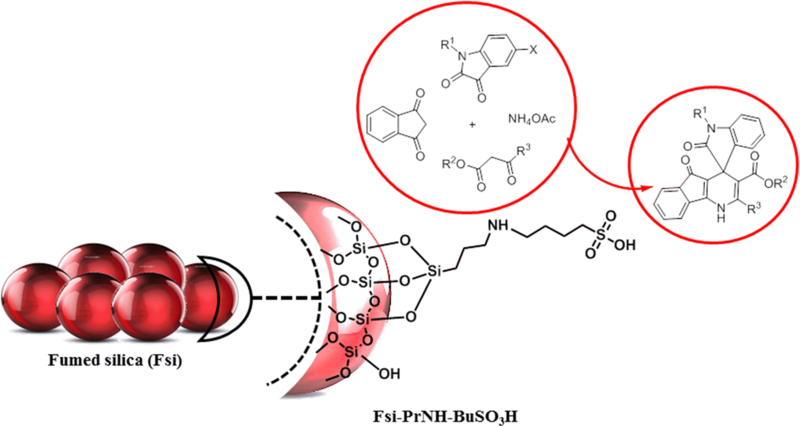 A dual-functional silica-based catalyst was prepared by treating fumed silica with amino-containing silane then 1,4-butane sultone. The presence of functional groups on the surface of the prepared amino sulfonic acid fumed silica (FSi–PrNH–Bu–SO3H) was confirmed by Fourier-transform infrared (FT-IR) spectroscopy. Energy-dispersive X-ray (EDX) elemental analysis showed the presence of S, N, C, O, and Si on the surface of the catalyst. The size of the agglomerated particles was observed to lie in the range of 30–50 nm by scanning electron microscopy (SEM). Finally, thermogravimetric analysis (TGA) revealed that the amount of organic compounds grafted on the surface of FSi–PrNH2 and FSi–PrNH–BuSO3H was 2.59 and 1.12 mmol/g, respectively. After well characterizing the FSi–PrNH–BuSO3H, it was used to catalyze the reaction of 1,3-indandione, isatin, ethyl acetoacetate, and ammonium acetate for synthesis of azafluorenone derivatives. 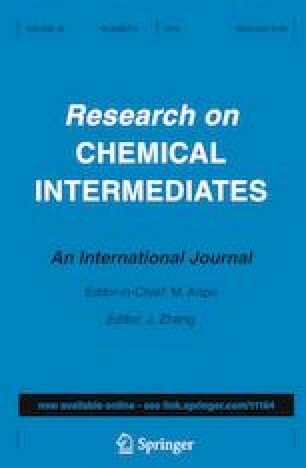 The online version of this article ( https://doi.org/10.1007/s11164-019-03740-4) contains supplementary material, which is available to authorized users. We gratefully acknowledge the financial support from the Research Council of Alzahra University and the University of Tehran.